House GOP Would Rather Not See Trump's Taxes. Quiet Rooms, People! QUIET ROOMS! House Republicans voted this week to quietly leave Donald Trump's tax returns secret, because honestly, who wants to be bothered with a lot of details about the details of his financial entanglements? Sure, maybe every president since Nixon has released his taxes, and Donald Trump said while campaigning that he intended to release them, but he's a busy man. Why bother him just because his taxes might reveal some unflattering details about who he's done business with? 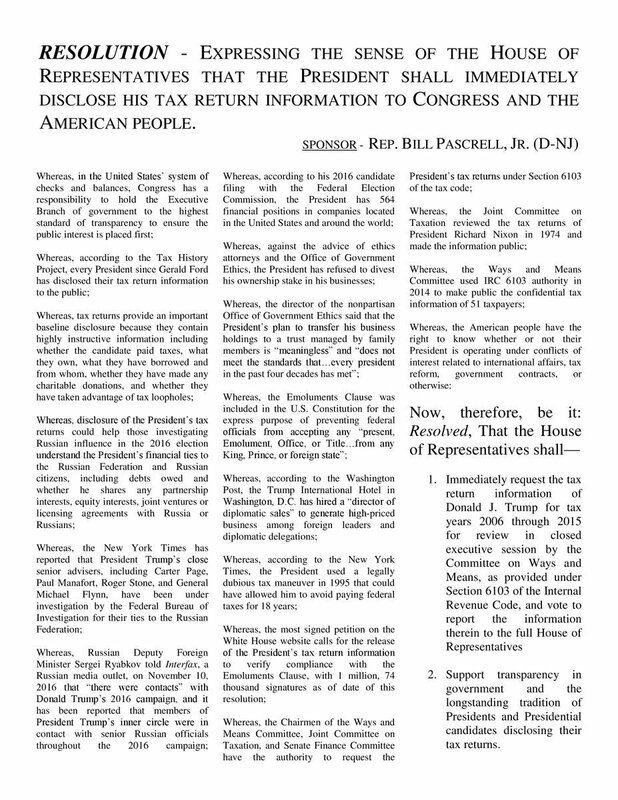 New Jersey Democratic Rep. Bill Pascrell introduced the measure calling on the Ways and Means Committee to request the president's taxes under an obscure 1924 law passed following the Teapot Dome scandal, which makes for a refreshing change from all those comparisons to Richard Nixon. Now we can also compare Trump's incompetence and corruption to those of Warren Gamaliel Harding. The law allows Ways & Means to examine individual tax records and then release them to the full Congress, making them a matter of public record. My belief is that if Congress begins to use its powers to rummage around in the tax returns of the president, what prevents Congress from doing the same to average Americans? Oh, how about because Congress would have no reason to examine whether ordinary Americans were deciding foreign and domestic policy while also having a financial interest in countries and businesses affected by U.S. policy? And maybe because ordinary citizens haven't raised questions about whether they've been doing business with a country that U.S. intelligence agencies believe intervened in our elections? Or because average Americans haven't been singled out by the head of the Office of Government Ethics for a complete failure to insulate their political activities from their business interests? If those seem like a stretch, how about simply because average Americans haven't ignored a basic tradition for presidential candidates going back 40 years? The House must demonstrate that it cares about protecting the integrity of our government, of our Constitution, of our system of checks and balances [...] Let's shine a bright light on the president's conflicts together as we as a Congress and the broader American public can judge whether his decisions are being made for himself, his business interests or for the greater good of the American people. In an earlier call for the release of Trump's taxes to Congress, Pascrell had called Congressional investigation of the president's business dealings "Checks and Balances 101." Needless to say, House Republicans don't care so much for Jimmy Stewart or oversight when it comes to Donald Trump's taxes. They voted nearly unanimously against Pascrell's resolution, although two Republicans, Mark Sanford and Walter Jones, bravely voted "present," those mavericks. So now the R's have gone all politically correct, telling Pascrell to check his privileged resolution. So there goes one more attempt to see Trump's taxes -- it was almost certainly doomed from the start, and what we really need is a law requiring party nominees to release their taxes -- but at least it put the Republicans on the record as not being especially interested in that "transparency" stuff, as if there had been any doubt. Besides, no one but the dishonest media wants to see Trump's taxes, outside maybe the 1.1 million people who've signed an online petition calling for the returns to be released, and the 74 percent of Americans in a January poll who say Trump should release his taxes. Let's just give the poor man his privacy. Yr Wonkette is ad-free and supported by your generous donations. If we ever run for president, you bet we'll release our taxes.